If you can find the blazing planet Jupiter in your western sky after sunset, you are virtually assured of seeing Mercury, the solar system’s innermost planet. As long as your western horizon is free of obstruction – like houses, trees, or cloud cover – Mercury should be yours tonight. Remember to start your search soon after sunset, because these two worlds will set about 80 minutes after sundown (at mid-northern latitudes). Look for Jupiter, the brightest point of light in the evening sky, low in the west at dusk. 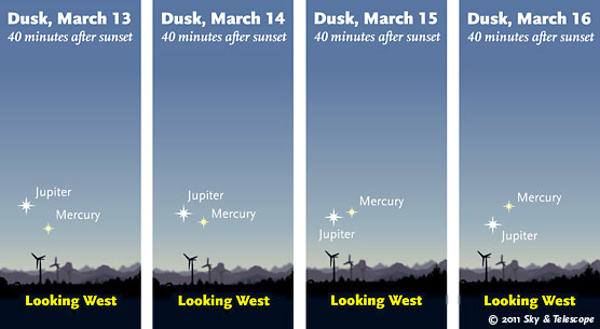 If you don’t see Mercury right next to Jupiter some 45 to 60 minutes after sunset, use binoculars to reel in Mercury. If foul weather prevents you from seeing Jupiter and Mercury this evening, do not despair. These two worlds will be found inside the same binocular field at dusk and early evening for the next several days. Day by day, note how Mercury is climbing away from the twilight glare, while Jupiter is falling into it. 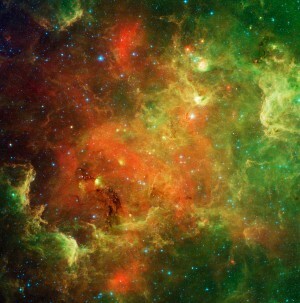 A week from now, on the evening of March 22, Mercury will be at its greatest elongation from the sun. Although Jupiter won’t be in the same binocular field with Mercury any longer, Mercury will be setting a whopping one hour and 40 minutes after the sun at that time. That should make Mercury easy to see, even without Jupiter as a guide. 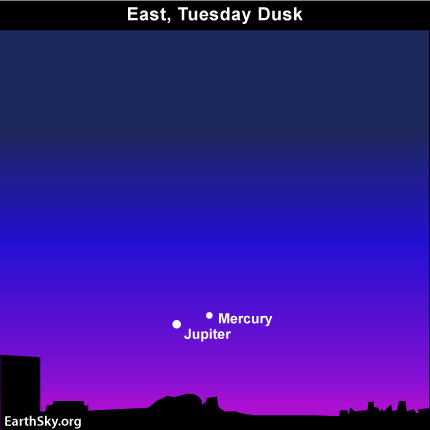 In the meantime, let Jupiter show you Mercury’s place in the western dusk during the middle part of March!